1. Preheat the oven to 160ºC, gas mark 3. 2. To make the crumble, place the sugar, almonds, flour and salt in a food processor and pulse a couple of times to mix through. Add the butter and pulse until lumps of dough are formed. If you don’t have a food processor, rub the ingredients together by hand. Spread the crumble on a tray lined with baking paper and place the tray in the preheated oven for 20–30 minutes or until golden brown. When cooked, remove the crumble from the oven and allow to cool. 3. While the crumble is cooking, make the strawberry and rose compote. Put the chopped strawberries into a pan with the fruit sugar and allow to stand for 15 minutes to macerate. Add the vodka (if using) and lemon juice. Place the pan over a medium heat, bring to the boil and allow to cook for approximately 6 minutes or until the strawberries have broken down and a thick syrup has formed. Remove the compote from the pan and place in a bowl over iced water to cool. Once completely cold, add the rest of the strawberries, rosewater and elderflower cordial. Stir to combine. 4. For the marbled cream, whip the cream to medium peaks and fold the yogurt into the whipped cream. Add 2 tbsp strawberry and rose compote and fold through to create a ripple effect. 5. To assemble, place the remaining compote into a large glass serving bowl and top with a layer of the marbled cream. 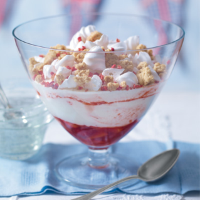 Sprinkle with meringue pieces and crumble and finish with freeze-dried strawberries. Any leftover crumble is delicious sprinkled on summer fruits with a spoonful of yogurt.